Crowdfunding sites like Kickstarter have enabled hordes of people to secure the funding necessary to live out their dreams and give back to the community through the various products they create (and the jobs created to build funded products). The recipe for a successful campaign is pretty cut and dry. A good product or idea certainly helps but as you may have noticed, it’s not always necessary. What you really need is a pitch video with a high production value, lots of professional-looking images and some well-written copy. That's where things can get tricky. A campaign that adheres to these guidelines demonstrates to potential backers that if a creator is willing to invest that much time and effort into their pitch, they must be serious about the product they are trying to fund. Unfortunately, it can also sometimes mean that someone has spent more time on their pitch than the product they’re trying to win you over with. All things considered, it’s not all that uncommon for shady characters to hide behind the veil of a polished pitch and pull a fast one on backers. That’s where Kickstarter’s latest tool could prove useful. 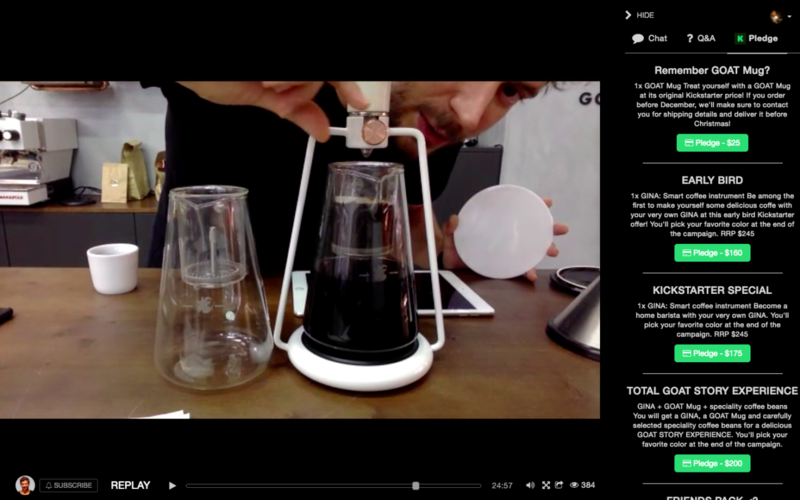 Kickstarter Live allows creators to connect directly with backers via live streaming video. Can the musician you’re thinking of backing actually play an instrument? Does that board game seem like it would be fun to play? How about that tech gadget prototype – does it actually do what the creator claims? Now you can find out via live streaming video that’s free of any post-production / editing magic. Kickstarter’s latest tool could help creators validate their campaigns while simultaneously allowing backers to see through the proverbial BS being spewed by dishonest creators simply looking to make a quick buck. There’s more to Kickstarter Live than just trying to convince backers to fund their campaign. Perhaps you’ve already got the funding you need for your album and you simply want to livestream a rehearsal session, show how manufacturing is coming along in real-time or host a Q&A session with backers. The new tool isn’t a guarantee that you won’t be scammed nor is it a substitute for good judgment. If you have a gut feeling about something, don't ignore it. If something seems too good to be true, it probably is. Even if everything is absolutely legitimate, unforeseen circumstances can crop up at any moment. What's more, live video isn't a repellent for incompetence. That said, the tool is certainly yet another step down the right path for Kickstarter and crowdfunding as a whole.